In 2012 my wife and I had to lay our sweet Remmy to rest. 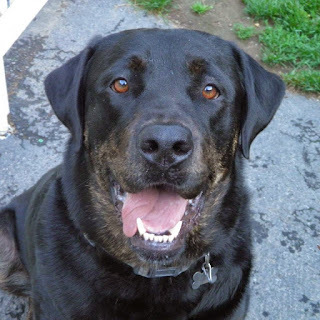 He was a big dog...black lab, rottie mix. Remmy was a gentle soul who loved to curl up with his Mamas and enjoyed lots of play time. In late summer of 2011, Remmy started to have sporadic bursts of aggression. There were no visible triggers. It just happened. Out of the blue. Without warning. We immediately sought help from a professional dog trainer. Then another. That was followed by medications...both prescription and all natural. We examined every aspect and made adjustments in hopes that it would help our Remmy. We put Remmy in doggy daycare for a bit. Maybe some extra socialization would help. His bursts of aggression worsened and became more frequent. In fact, the last time we had boarded him for a couple of days, it was reported that he became aggressive and attacked the walls of his kennel when staff walked by. There were marks on his nose to verify that. This went on for about a year. During the last month, we knew he wasn't going to get better. Remmy had a sickness in his brain. We learned that his mother and 2 of his siblings had suffered the same fate. Our veterinarian, at the time, was both honest with us and sensitive to the situation. There was a good chance Remmy would turn on us or viciously attack someone else. By then, he had attempted to go through our window once...tearing down the blinds with his teeth. A week before we laid him to rest, he had dragged Lisa into the fence during one of his rages. Lisa and I had several difficult conversations that ended in tears. We knew what we had to do however, what we really wanted to do was hold on to our sweet Remmy. It's moments like these when the heart speaks louder than our voice of reason. The day we laid Remmy to rest, we didn't know it was going to be his last day. 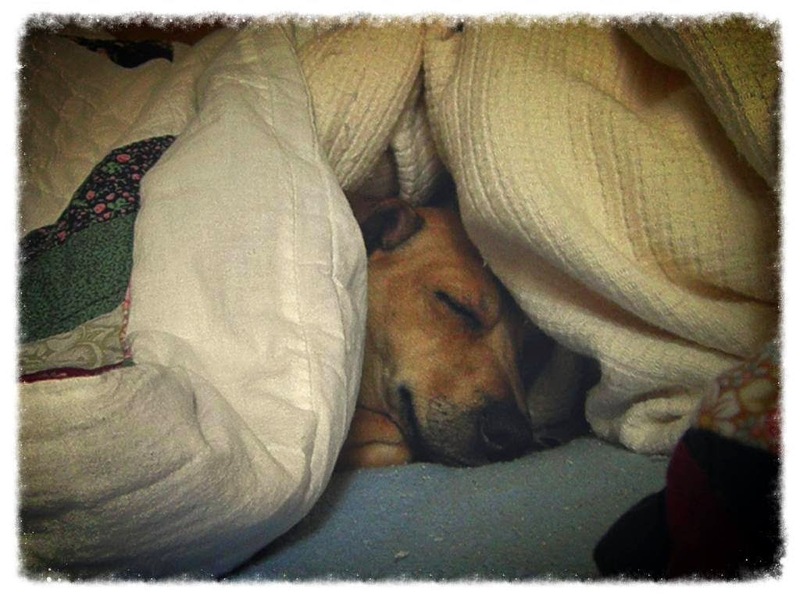 Shortly after noon, Remmy shifted into an aggressive state unlike anything I had ever seen. His determination to get through the window was fierce. He ripped down the blinds with his teeth. There was no doubt in my mind that this would be the time he broke through the window. With both hands I grabbed him by the collar and pulled him back. It took every ounce of strength. Whether it was the right or wrong thing to do...at that moment, I didn't care. Our Remmy was not going through that window and sustaining painful injuries. Towards the end of his "episode" Remmy flung around and was in attack mode. He growled at me. I could see every tooth in his mouth. The top of my finger was broken. I cried and gently begged Remmy not to attack me. My heart was breaking. This was not our Remmy. Like with most of his episodes, he came out of it quickly. Just in time. Then...he was fine. It was as if nothing happened. Remmy looked up at me with his big eyes. I told him it was okay...it wasn't his fault. I held the phone in my hand for what seemed like forever before calling Lisa at work. We talked. We cried. She called our veterinarian. The appointment was made. After Lisa returned home from work, we made the most of what little time we had left with Remmy. If you're a pet parent who's ever had to lay your fur-kid to rest, you know what those last moments are like. We were in a daze. Our hearts were broken. The ride to the animal hospital was excruciating. And then, when Remmy took his final breath, I buried my face in his fur and cried. In addition to the grief that followed, there was an emptiness in our house. It was too quiet. About a week after laying Remmy to rest, I couldn't get my mind off of Coco. He had been rescued from his nightmare a few months prior, however, the place where he was staying...deplorable. Maybe it was Remmy's spirit or my hyperactive intuition. Something kept tugging at me. It was a feeling I had in my gut. Something was wrong with Coco. We needed to do something. A few days later, less than two weeks after laying Remmy to rest, we adopted Coco. Long story short, Coco was very sick. His medical needs had not been tended to. Along with that, Coco had been adopted out twice and brought back. Between his behavioral and medical issues, his situation was urgent. In the days to follow after adopting our lil' Coco bug, the critics stepped forth. A few made snarky comments regarding our decision to adopt him so quickly after laying Remmy to rest. Others chose to give us disapproving replies as we shared Coco's story. One individual had the audacity to throw a temper tantrum after we had to cancel plans that involved us traveling out of state for several days. When we explained the situation, their reply was, "He's just a dog. You could have waited to take him home." I've got thick skin and can handle pretty much anything. However, I was completely stunned by the lack of support and the frequency in which people plastered their harsh judgments on us. This went on for quite some time. The comments were all over the charts however, what stung the most are the ones who insinuated "we must not have loved Remmy that much if we could replace him so quickly." That's when we took a stand. Enough was enough. We no longer bit our tongues. We put our foot down when people attempted to make a comment or give us that look. A few ties were severed. Our time wasn't going to be wasted having to defend our decisions. It didn't take long for things to simmer down. Those who knew the story in its entirety were supportive and assisted with Coco's rehabilitation. They knew Remmy and Coco had played together on several occasions and, like us, believed that feeling in my gut was Remmy's way of letting us know Coco needed us...and it was okay. We had no regrets about the decisions we made. In fact, when Lisa and I would reminisce about our sweet Remmy, a sense of peace would fill the room. We used to say it was Remmy's way of thanking us for saving his friend. While all of this was happening...the visits to the animal hospital, administering medications, trying recipes from a pet nutritionist because he wouldn't eat store bought food, and working on Coco's behavioral issues...we were still grieving for our Remmy. That didn't stop when we adopted Coco. I remember laying with Coco and talking about Remmy. Tears would roll down my cheeks and Coco would lick them from my face. During those moments, we bonded. Remmy was a part of that. This is the very reason why, when someone asks how long should they wait before welcoming another fur-kid into the family, I always tell them, "You'll know when the time is right." Just recently I read a story of a woman who adopted a week after losing her pup. A friend of mine waited a year after her cat of 17 years passed. There is no right or wrong length of time. Regardless of your decisions, people will judge. Whether it's a week and a half or ten months...the critics are out there with advice and opinions. Ignore them. It's not their decision. It's not their grieving process. It's yours. It's personal. You're not required to defend your decision nor do you have to explain yourself. And, by all means, never allow others to make you feel guilty.